Major earthquakes may happen anywhere you live, work, or travel. 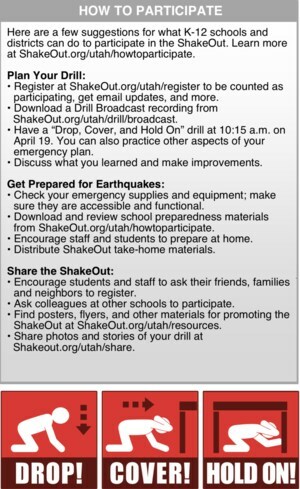 The ShakeOut is our chance to practice how to protect ourselves, and for everyone to become prepared. The goal is to prevent a major earthquake from becoming a catastrophe for you, your organization, and your community. Why is a “Drop, Cover, and Hold On” drill important? To respond quickly you must practice often. You may only have seconds to protect yourself in an earthquake before strong shaking knocks you down, or something falls on you. Millions of people worldwide have participated in Great ShakeOut Earthquake Drills since 2008. 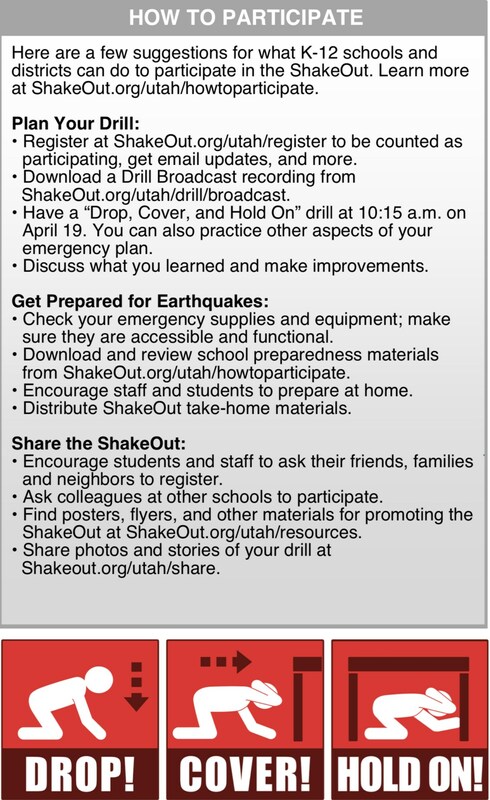 The first Utah ShakeOut was held in 2012 as part of a statewide earthquake response exercise.